Sometimes by re-configuring dumb technology, a simple innovative solution could be attained that produces better results. The space needed to farm shrimp has been a constraint in the aquaculture industry for some time. 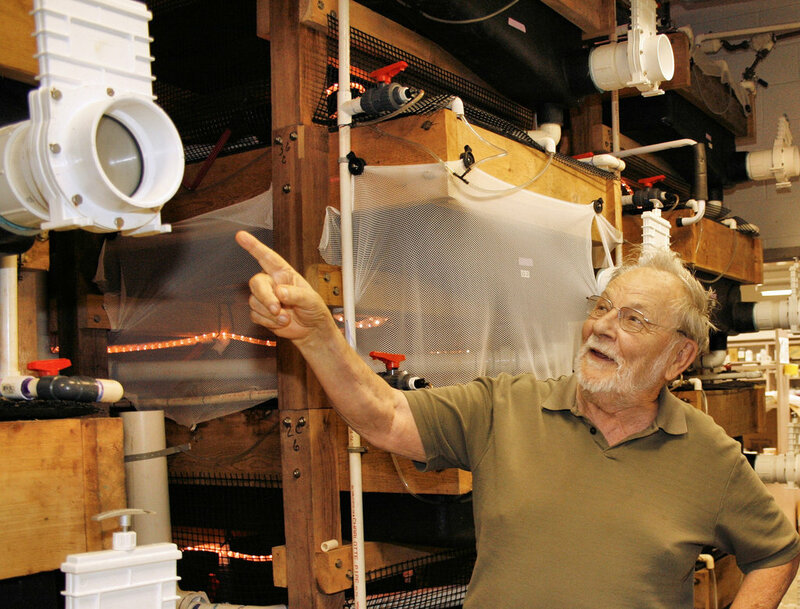 Due to intense regulations concerning environmental factors, the most effective method to grow shrimp inland was in tubs operated with a flow systems. This system allows for the re-circulation of the limited water supply available and minimizes any effluent seepage, or soil contamination. The production capacity of the farm was limited to the space available because the tubs could only produce a limited amount of shrimp and thus made it cost prohibitive for American farmers to operate at a profitable level. This made importing shrimp a cheaper alternative and placed American farmers in a competitive disadvantage in the international market. In a NY Time article Dr. Addison L. Lawrence has figured out a simple solution to obtaining higher yields by re-configuring the same technology that was already available. Dr. Lawrence increased the volume of production by stacking the water tubs on top of each other and thus maximizing the use of the available space. This simple solution benefits all the industry’s stakeholders (American consumers, American farmers and the environment), by increasing the production level, lowering market prices and maintaining proper environmental stewardship. As is well understood, the greater the percentage of EV fuel derived from renewable sources, the greater the sustainability edge is to electrified transportation over fossil-fuel based transportation. The need for separate electrical equipment to handle PV capture and EV charging is both a cost and a hassle barrier to adoption. Not all PV users drive EV’s, and not all EV drivers have roofs with PV panels but this is a population which will grow exponentially as both technologies improve and become ubiquitous. The increased efficiency in EV charging by leveraging gathered solar energy at the point of collection is a material gain to the consumer/homeowner. The SolarEdge HD-Wave inverter-integrated EV charger reduces the hassle of installing a separate standalone EV charger and a PV inverter. Furthermore, it eliminates the need for additional wiring, conduit and a breaker installation. By installing an EV charger that is integrated with an inverter, no additional dedicated circuit breaker is needed, saving space and ruling out a potential upgrade to the main distribution panel. Off grid solar powered water device – Zero Mass Water. Billions of people around the world still lack access to clean drinking water around them. Many have to travel for tens of kilometers just to access this resource. Many of these areas are located in rural parts of the developing world which are also not connected to the grid (i.e, are un-electrified). Arizona start-up called Zero Mass Water, has invented a solar-based system called Source, that absorbs moisture from the air and converts it into drinking water. It does not have to be hooked up to an electric grid or an existing water system. It contains a solar panel that provides energy which drives air through a proprietary water-absorbing material and powers condensation of the extracted moisture into fluid. The systems also contains a small lithium-ion battery to operate the device when the sun is not shining. Populations in areas with lack of access to clean drinking water. Marketing campaign to increase awareness of products to relevant stakeholders. Partner with local governments and NGOs to secure distribution and supply chain to remote parts of the world affected by this problem. Have enough manufacturing capacity to ensure demand is met. Windflock is a wind-energy system based on a modular structure with an open and flexible ‘add-on’ system made of mini windmills. The structure looks like a 3D crystal composition, and the assembly is described to be as easy as putting together LEGOs, and other mini windmills can be connected to each other, which makes the units widely accessible for buyers ranging from different skill levels. This Windflock may be located between buildings or atop them as part of the whole construction. Introduce this technology to governments, building owners, energy companies, and residents. Technologies: Offshore seaweed and microalgae farming, which has been around for many years, can lead to mass production of clean energy in the form of biofuels. Seaweed grows faster than land-based plants and sequesters large CO2 amounts as it does, decreasing carbon emissions in the air. Feeding cattle seaweed can reduce their methane emissions. Furthermore, these efforts could restore carbon-rich marine ecosystems. Conduct further research to determine net benefits of seaweed, as well as effects on marine life. Determine proper locations and times where seaweed can be harvested and create more commercialized farms with advanced components such as computer modeling and aquatic monitoring for better maintenance. To begin using biofuels in cars however, more research must be done on improving the power density of this fuel source. I’ve seen this being used on the coastal areas of South America as well. This comes from a survival technique, similar to using a plastic bag to collect transpiration from nearby plants and trees or from rainwater. My only concern is how does this trapping of condensation, which acts as the main sink of atmospheric water, affect the water cycle and climate? Over 30% of produce harvested is never consumed and every year, almost $30 billion worth, or 25 billion pounds, of fruits and vegetables are wasted. This happens even though there are about 42 million people who don’t have enough to eat in just the U.S. alone. Wasted produce also means that all the time, energy, money, and water put into cultivating it is also wasted. However, it is hard to avoid this problem because there are so many steps between the growth and consumption of produce. FruitBrite can extend produce’s lifespan by 2-3 weeks and has been tested on various produces including apples, asparagus, broccoli, cherries, tomatoes, etc.